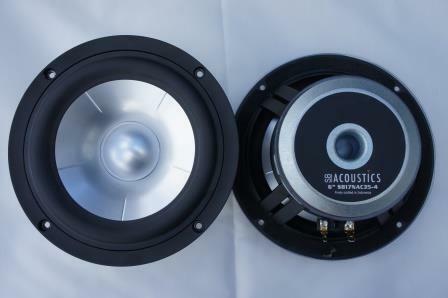 The SB17NAC35-4 is a 4Ω 6″ mid-woofer from SB Acoustics. The mid-woofer has a 35.5mm voice-coil with a 11mm (p-p) linear coil travel. It has a very low voice-coil inductance and is fitted with a copper sleeve on the pole piece to ensure a low distortion performance. Geometrically reinforced aluminum cone for optimum piston operation and reduced break-up. 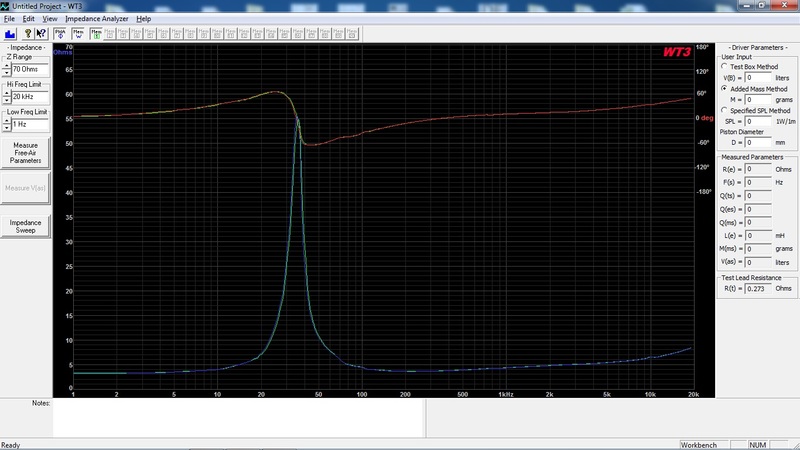 Left: T/S parameters measured with Smith & Larson Audio WT2 woofer tester. Right: T/S parameters measured with Dayton Audio WT3 woofer tester. Minor differences between the four driver unit samples. High mechanical Q-factor (Qms) and low mechanical loss (Rms). 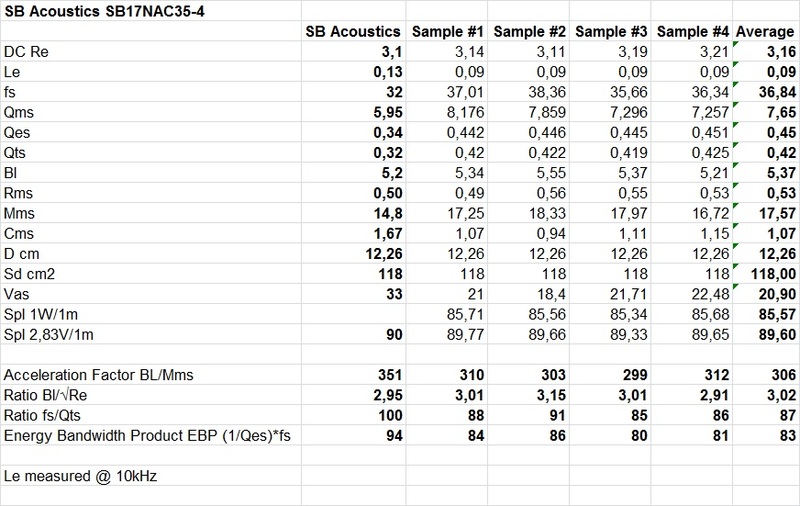 The SB17NAC35-4 mid-woofer should work fine in 18-22 liter enclosures. Note the very low inductance. Due to the mid-woofers very low inductance and flat impedance response, the on-axis frequency response has an extended response up to about 20kHz. It has a sloping frequency response from 1.5kHz, but it´s very smooth up to 4kHz. The typical hard cone driver cone break-up occurs slightly above 10kHz, which is very high up in frequency for a driver in this size. The cone break-up is also very well suppresed and the geometrically reinforced aluminum cone seems to be very effective in reducing the cone break-ups. 2-2.5kHz is about the highest suitable cross-over frequency for this mid-woofer. 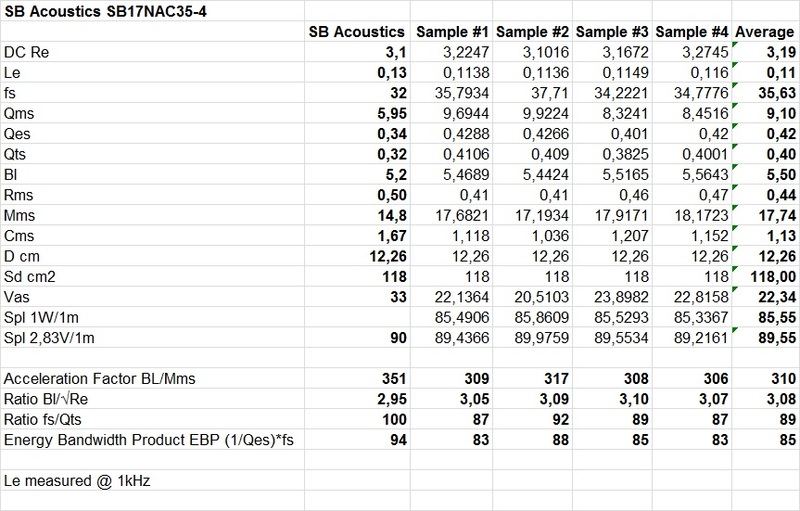 The SB17NAC35-4 mid-woofer has an amazingly low distortion profile. 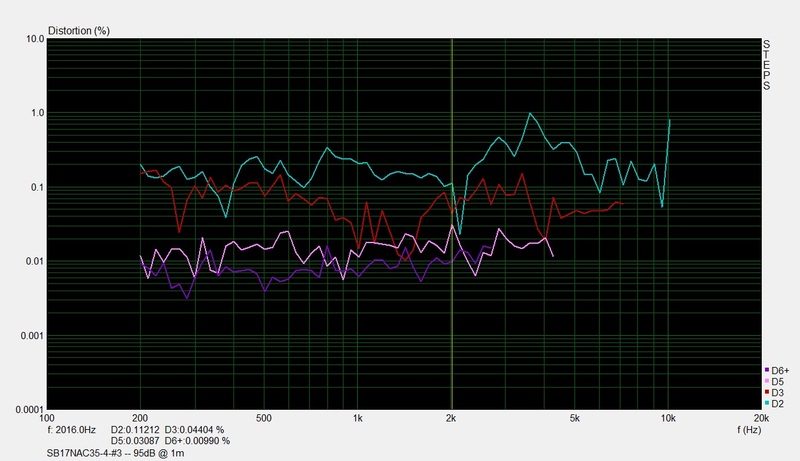 Within its usable frequency range, the third-order distortion is below 0.2%. Above 2kHz, the relatively harmless second-order harmonics rises, but the third-order is still very low without any signs of the typical odd-order distortion peak caused by the cone break-up.